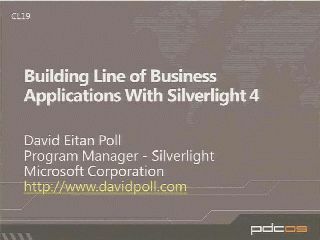 David Eitan Poll is a Program Manager on the Silverlight team. He joined Microsoft in June 2008 after two summer internships with the Application Frameworks team. Before joining Microsoft, David was a student at the University of California at Berkeley, where he earned a B.A. and M.Sc. in Computer science. He keeps a blog where he frequently discusses Silverlight tips, tricks, and development, which you can find at http://www.davidpoll.com.